Violence in Kerala must cease. The unceasing violence between CPM and RSS workers in Kerala is taking a dangerous turn. It is the ordinary workers from both sides who are sacrificing their lives and the leaders, who are surrounded by police, are relatively safe. 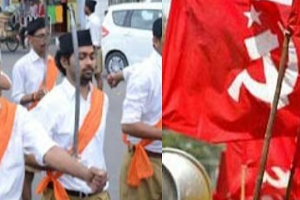 It is a well-known fact that Swayamsevaks and Comrades are poles apart and they hate each other intensely. BJP, the political affiliate of RSS, is trying hard to expand its influence in Kerala and is on an aggressive expansion spree. It appears that the comrades, as a last ditch effort to save their bastion, are resorting to violence. It is not just the RSS workers who lost their lives in the violence but many of the CPM workers were also killed. The comrades are to a great extent are responsible for this unabated violence. Since they are in power they have a greater responsibility on their shoulders. It is the responsibility of the government to safeguard the lives of all the citizens irrespective of their political affiliations and the ideologies they subscribe to. Just because a person subscribes to a different ideology one can’t physically eliminate him or her. Even the media and the civil society appear to be biased in their response to Kerala violence. The violence unleashed by the Gaurakshaks in various parts of the country is given a lot of coverage but the political violence unleashed by CPM workers, apparently backed by the state government, is not given much importance by the intellectuals. Arun Jaitley was right when he said: “had it been in any BJP ruled states awards would have been returned”. Therefore, the entire civil society has to condemn these killings unequivocally and the ruling LDF government should take immediate steps to put an end to this mindless violence. Comrades should understand that the best way to combat the politics of BJP and its ideological mentor RSS is facing them ideologically and defeat their regressive ideology by bringing about awareness among the people. At the same time, these days not even a day passes by without we reading about how Kerala is becoming a Jihadi factory and how the indoctrinated youth are joining the monstrous ISIS and how innocent women are lured in the name of love, converted and sent to join the ranks of ISIS. All these things are happening in Kerala which is known for its progressive ideas and outlook. Keralites have to introspect and take corrective steps as a society. This entry was posted in Politics and tagged CPM, Kerala, RSS, violence on August 6, 2017 by Dr. Ramachandra Reddy.